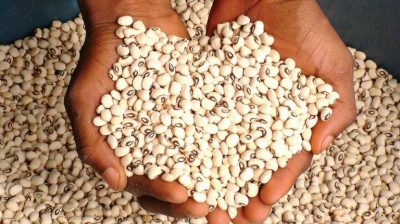 The Consumer Protection Council (CPC) says it has confirmed that retailers in the open market are using a pesticide popularly known as sniper to preserve beans. In 2017, some traders were arrested in Lagos for using the pesticide, and on Thursday, a video showing some of the traders using sniper to preserve beans had gone viral. In an advisory signed, on Friday, by Babatunde Irukera, director-general of CPC, the council explained that the retailers might have set out to protect beans from weevils, but the chemical composition of the pesticide used is injurious. “The Consumer Protection Council (CPC) has recently confirmed by credible information that retailers, mostly in the open market, are using a pesticide, 2,2-dichlorovinyl dimethyl phosphate (DDVP) compound otherwise marketed and known as “Sniper” to preserve beans, and more particularly eliminate or protect from weevils,” the statement read. Although cooking generally eliminates or significantly reduces risk of exposure from pesticides, CPC added that consumers should make sufficient inquiries before buying, and parboil extensively, before further cooking for consumption. An official at the CPC told TheCable that “they are carrying out surveillance and would update the public with further findings”.